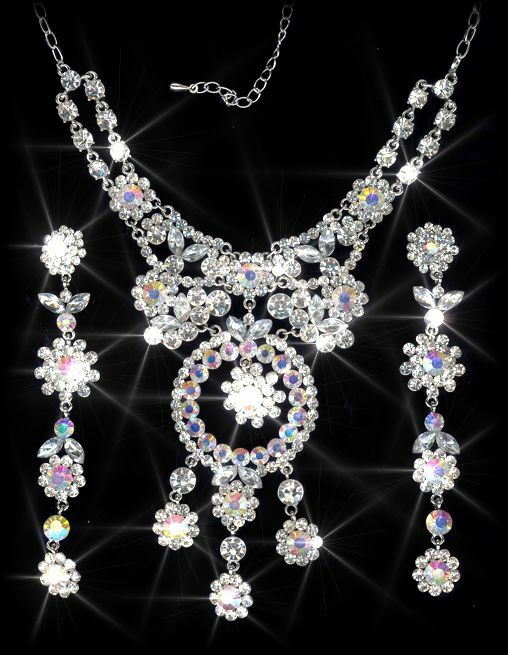 Totally spectacular, big bold statement piece created in shimmering Clear and Aurora Borealis crystals, with a silver finish. Bright and vivacious with a dramatic centrepiece and long, long dangling temptress earrings, this entire set looks divine and is a real attention-grabber. Not for the faint-hearted! Length: 31cm (12") + 8cm (3") extension. Centrepiece: 13cm(5") x 5cm (2"). Earrings: 2cm (4½") drop.